Explore international student trends at University of Houston to discover how U of H stacks up to the competition when it comes to serving students from outside the United States. How Does U of H Serve International Students? Overall, U of H is among the top schools for students from outside the United States. They are ranked 20th out of 1,204 in our Overall Best Value U.S. Colleges & Universities for International Students. The presence of international students on campus means a greater diversity of options, perspectives and knowledge to add to the diversity of thought on campus. As the economy becomes more global in scope, interaction with students from all different countries becomes an important part of higher education. An analysis of student visa data suggests that in 2017 as many as 1,064,586 international students came to the U.S. to study at American colleges and universities. From this diverse international pool, U of H was home to approximately 3,995 international students. College Factual ranks U of H as 35th out of a total 1,300 colleges and universities for popularity with international students. At least 50 countries are represented on the U of H campus. The countries with the largest on-campus communities are India, China, and Vietnam. University of Houston reports having a total of 3,995 international students on campus, 1,632 of whom are undergraduates. This is out of a total of 43,774 students, 35,995 of whom are undergraduates. U of H suggests that international students make up about 9.1% of the student body. 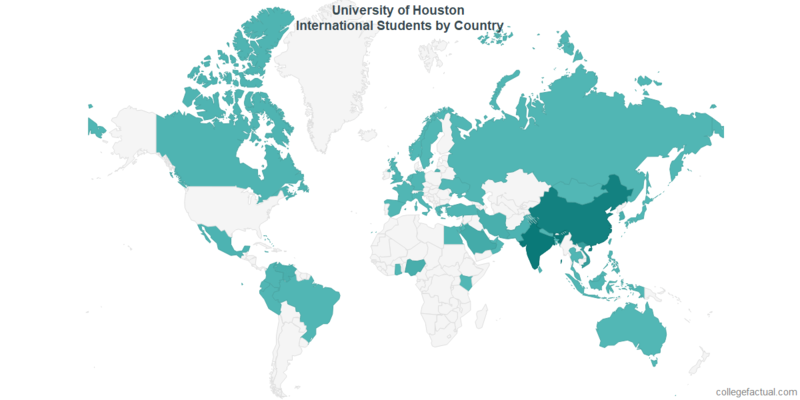 Use the map below to explore the popularity of University of Houston on a country by country basis. Over the last five years the total international population of students on campus has grown at an average rate of 8.0%. India is the largest contributor to this growth, with an estimated total of 996 students. The chart below shows how the total number of international students at U of H has grown over the past five years. Use the map below to explore the popularity trends on a country by country basis. College Factual ranks U of H as 125th out of 1,240 total colleges and universities for providing a quality educational experience to international students. CollegeFactual has also ranked the quality of the education at U of H on a country by country basis. U of H ranks the best for are for students from Vietnam, Nigeria, and Venezuela. Use the map below to explore the University of Houston experience for your country. College Factual ranks U of H as 20th out of a total 1,204 colleges and universities for providing value to international students. CollegeFactual has also ranked the value of the education at U of H on a country by country basis. U of H's best value is for students from Vietnam, Venezuela, and China. Use the map below to explore University of Houston value for your country. The most popular degrees at U of H with international students are Basic Developmental & Remedial Education, Business Administration & Management, and Mechanical Engineering. Use the map below to explore the most popular degrees at University of Houston on a country by country basis. 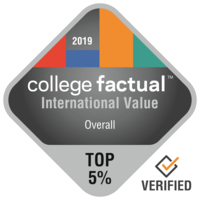 College Factual’s International Value ranking attempts to show which colleges and universities give international students the best quality for the money paid. Read the methodology for this ranking here. Drill into the map below or use the following table to select a specific country and get detailed University of Houston information specific to that country. An analysis of student visa data suggests that in 2017 as many as 183,312 Indian students came to the U.S. to study at American colleges and universities. From this pool of 183,312, U of H was home to approximately 996 Indian students. College Factual ranks U of H as 26th out of a total 958 colleges and universities for sheer popularity with students from India. Indian students could account for as much as 2.3% of the entire student body and as much as 24.9% of the international student body at U of H.
Over the last five years the total Indian population of students on campus has grown at an average rate of 10.2%. The chart below shows how the total number of Indian students at U of H has grown over the past five years. College Factual ranks U of H as 68th best out of 643 total colleges and universities for providing a quality educational experience to Indian students. College Factual ranks U of H as 14th out of a total 626 colleges and universities for providing value to Indian students. An analysis of student visa data suggests that in 2017 as many as 368,073 Chinese students came to the U.S. to study at American colleges and universities. From this pool of 368,073, U of H was home to approximately 865 Chinese students. College Factual ranks U of H as 77th out of a total 1,059 colleges and universities for sheer popularity with students from China. Chinese students could account for as much as 2.0% of the entire student body and as much as 21.7% of the international student body at U of H.
Over the last five years the total Chinese population of students on campus has grown at an average rate of 7.4%. The chart below shows how the total number of Chinese students at U of H has grown over the past five years. College Factual ranks U of H as 115th best out of 835 total colleges and universities for providing a quality educational experience to Chinese students. College Factual ranks U of H as 15th out of a total 817 colleges and universities for providing value to Chinese students. An analysis of student visa data suggests that in 2017 as many as 14,728 Vietnamese students came to the U.S. to study at American colleges and universities. From this pool of 14,728, U of H was home to approximately 421 Vietnamese students. College Factual ranks U of H as 1st out of a total 841 colleges and universities for sheer popularity with students from Vietnam. Vietnamese students could account for as much as 1.0% of the entire student body and as much as 10.5% of the international student body at U of H.
Over the last five years the total Vietnamese population of students on campus has grown at an average rate of 13.6%. The chart below shows how the total number of Vietnamese students at U of H has grown over the past five years. College Factual ranks U of H as 2nd best out of 465 total colleges and universities for providing a quality educational experience to Vietnamese students. College Factual ranks U of H as 4th out of a total 452 colleges and universities for providing value to Vietnamese students. An analysis of student visa data suggests that in 2017 as many as 67,917 Saudi Arabian students came to the U.S. to study at American colleges and universities. From this pool of 67,917, U of H was home to approximately 200 Saudi Arabian students. College Factual ranks U of H as 55th out of a total 730 colleges and universities for sheer popularity with students from Saudi Arabia. Saudi Arabian students could account for as much as 0.5% of the entire student body and as much as 5.0% of the international student body at U of H.
Over the past five years the total Saudi Arabian population of students on campus has shrunk. The chart below shows how the total number of Saudi Arabian students at U of H has grown over the past five years. College Factual ranks U of H as 57th best out of 555 total colleges and universities for providing a quality educational experience to Saudi Arabian students. College Factual ranks U of H as 23rd out of a total 545 colleges and universities for providing value to Saudi Arabian students. An analysis of student visa data suggests that in 2017 as many as 11,049 Nigerian students came to the U.S. to study at American colleges and universities. From this pool of 11,049, U of H was home to approximately 145 Nigerian students. College Factual ranks U of H as 1st out of a total 837 colleges and universities for sheer popularity with students from Nigeria. Nigerian students could account for as much as 0.3% of the entire student body and as much as 3.6% of the international student body at U of H.
Over the last five years the total Nigerian population of students on campus has grown at an average rate of 10.8%. The chart below shows how the total number of Nigerian students at U of H has grown over the past five years. College Factual ranks U of H as 14th best out of 426 total colleges and universities for providing a quality educational experience to Nigerian students. College Factual ranks U of H as 13rd out of a total 416 colleges and universities for providing value to Nigerian students. An analysis of student visa data suggests that in 2017 as many as 12,652 Iranian students came to the U.S. to study at American colleges and universities. From this pool of 12,652, U of H was home to approximately 125 Iranian students. College Factual ranks U of H as 6th out of a total 466 colleges and universities for sheer popularity with students from Iran. Iranian students could account for as much as 0.3% of the entire student body and as much as 3.1% of the international student body at U of H.
Over the last five years the total Iranian population of students on campus has grown at an average rate of 28.5%. The chart below shows how the total number of Iranian students at U of H has grown over the past five years. College Factual ranks U of H as 42nd best out of 263 total colleges and universities for providing a quality educational experience to Iranian students. College Factual ranks U of H as 7th out of a total 256 colleges and universities for providing value to Iranian students. An analysis of student visa data suggests that in 2017 as many as 5,862 Venezuelan students came to the U.S. to study at American colleges and universities. From this pool of 5,862, U of H was home to approximately 112 Venezuelan students. College Factual ranks U of H as 6th out of a total 647 colleges and universities for sheer popularity with students from Venezuela. Venezuelan students could account for as much as 0.3% of the entire student body and as much as 2.8% of the international student body at U of H.
Over the last five years the total Venezuelan population of students on campus has grown at an average rate of 9.4%. The chart below shows how the total number of Venezuelan students at U of H has grown over the past five years. College Factual ranks U of H as 15th best out of 227 total colleges and universities for providing a quality educational experience to Venezuelan students. College Factual ranks U of H as 4th out of a total 219 colleges and universities for providing value to Venezuelan students. An analysis of student visa data suggests that in 2017 as many as 63,119 South Korean students came to the U.S. to study at American colleges and universities. From this pool of 63,119, U of H was home to approximately 109 South Korean students. College Factual ranks U of H as 98th out of a total 946 colleges and universities for sheer popularity with students from South Korea. South Korean students could account for as much as 0.2% of the entire student body and as much as 2.7% of the international student body at U of H.
Over the past five years the total South Korean population of students on campus has shrunk. The chart below shows how the total number of South Korean students at U of H has grown over the past five years. College Factual ranks U of H as 99th best out of 587 total colleges and universities for providing a quality educational experience to South Korean students. College Factual ranks U of H as 22nd out of a total 576 colleges and universities for providing value to South Korean students. An analysis of student visa data suggests that in 2017 as many as 20,725 Taiwanese students came to the U.S. to study at American colleges and universities. From this pool of 20,725, U of H was home to approximately 74 Taiwanese students. College Factual ranks U of H as 49th out of a total 662 colleges and universities for sheer popularity with students from Taiwan. Taiwanese students could account for as much as 0.2% of the entire student body and as much as 1.9% of the international student body at U of H.
Over the last five years the total Taiwanese population of students on campus has grown at an average rate of 1.4%. The chart below shows how the total number of Taiwanese students at U of H has grown over the past five years. College Factual ranks U of H as 81st best out of 356 total colleges and universities for providing a quality educational experience to Taiwanese students. College Factual ranks U of H as 10th out of a total 347 colleges and universities for providing value to Taiwanese students. An analysis of student visa data suggests that in 2017 as many as 12,059 Mexican students came to the U.S. to study at American colleges and universities. From this pool of 12,059, U of H was home to approximately 64 Mexican students. College Factual ranks U of H as 23rd out of a total 755 colleges and universities for sheer popularity with students from Mexico. Mexican students could account for as much as 0.1% of the entire student body and as much as 1.6% of the international student body at U of H.
Over the last five years the total Mexican population of students on campus has grown at an average rate of 10.6%. The chart below shows how the total number of Mexican students at U of H has grown over the past five years. College Factual ranks U of H as 54th best out of 297 total colleges and universities for providing a quality educational experience to Mexican students. College Factual ranks U of H as 9th out of a total 291 colleges and universities for providing value to Mexican students. An analysis of student visa data suggests that in 2017 as many as 4,898 Pakistani students came to the U.S. to study at American colleges and universities. From this pool of 4,898, U of H was home to approximately 57 Pakistani students. College Factual ranks U of H as 3rd out of a total 571 colleges and universities for sheer popularity with students from Pakistan. Pakistani students could account for as much as 0.1% of the entire student body and as much as 1.4% of the international student body at U of H.
Over the last five years the total Pakistani population of students on campus has grown at an average rate of 6.8%. The chart below shows how the total number of Pakistani students at U of H has grown over the past five years. College Factual ranks U of H as 50th best out of 253 total colleges and universities for providing a quality educational experience to Pakistani students. College Factual ranks U of H as 10th out of a total 247 colleges and universities for providing value to Pakistani students. An analysis of student visa data suggests that in 2017 as many as 29,508 Canadian students came to the U.S. to study at American colleges and universities. From this pool of 29,508, U of H was home to approximately 46 Canadian students. College Factual ranks U of H as 81st out of a total 1,049 colleges and universities for sheer popularity with students from Canada. Canadian students could account for as much as 0.1% of the entire student body and as much as 1.2% of the international student body at U of H.
Over the last five years the total Canadian population of students on campus has grown at an average rate of 6.9%. The chart below shows how the total number of Canadian students at U of H has grown over the past five years. College Factual ranks U of H as 115th best out of 644 total colleges and universities for providing a quality educational experience to Canadian students. College Factual ranks U of H as 17th out of a total 632 colleges and universities for providing value to Canadian students. An analysis of student visa data suggests that in 2017 as many as 11,955 Nepali students came to the U.S. to study at American colleges and universities. From this pool of 11,955, U of H was home to approximately 45 Nepali students. College Factual ranks U of H as 41st out of a total 646 colleges and universities for sheer popularity with students from Nepal. Nepali students could account for as much as 0.1% of the entire student body and as much as 1.1% of the international student body at U of H.
Over the last five years the total Nepali population of students on campus has grown at an average rate of 20.3%. The chart below shows how the total number of Nepali students at U of H has grown over the past five years. College Factual ranks U of H as 24th best out of 350 total colleges and universities for providing a quality educational experience to Nepali students. College Factual ranks U of H as 25th out of a total 340 colleges and universities for providing value to Nepali students. An analysis of student visa data suggests that in 2017 as many as 6,658 Bangladeshi students came to the U.S. to study at American colleges and universities. From this pool of 6,658, U of H was home to approximately 34 Bangladeshi students. College Factual ranks U of H as 29th out of a total 530 colleges and universities for sheer popularity with students from Bangladesh. Bangladeshi students could account for as much as 0.1% of the entire student body and as much as 0.9% of the international student body at U of H.
Over the last five years the total Bangladeshi population of students on campus has grown at an average rate of 18.8%. The chart below shows how the total number of Bangladeshi students at U of H has grown over the past five years. College Factual ranks U of H as 65th best out of 265 total colleges and universities for providing a quality educational experience to Bangladeshi students. College Factual ranks U of H as 19th out of a total 258 colleges and universities for providing value to Bangladeshi students. An analysis of student visa data suggests that in 2017 as many as 5,991 Colombian students came to the U.S. to study at American colleges and universities. From this pool of 5,991, U of H was home to approximately 34 Colombian students. College Factual ranks U of H as 26th out of a total 700 colleges and universities for sheer popularity with students from Colombia. Colombian students could account for as much as 0.1% of the entire student body and as much as 0.9% of the international student body at U of H.
Over the last five years the total Colombian population of students on campus has grown at an average rate of 7.0%. The chart below shows how the total number of Colombian students at U of H has grown over the past five years. College Factual ranks U of H as 65th best out of 269 total colleges and universities for providing a quality educational experience to Colombian students. College Factual ranks U of H as 12nd out of a total 261 colleges and universities for providing value to Colombian students. An analysis of student visa data suggests that in 2017 as many as 8,797 Turkish students came to the U.S. to study at American colleges and universities. From this pool of 8,797, U of H was home to approximately 27 Turkish students. College Factual ranks U of H as 57th out of a total 537 colleges and universities for sheer popularity with students from Turkey. Turkish students could account for as much as 0.1% of the entire student body and as much as 0.7% of the international student body at U of H.
Over the past five years the total Turkish population of students on campus has shrunk. The chart below shows how the total number of Turkish students at U of H has grown over the past five years. College Factual ranks U of H as 99th best out of 278 total colleges and universities for providing a quality educational experience to Turkish students. College Factual ranks U of H as 12nd out of a total 268 colleges and universities for providing value to Turkish students. An analysis of student visa data suggests that in 2017 as many as 9,606 British students came to the U.S. to study at American colleges and universities. From this pool of 9,606, U of H was home to approximately 26 British students. College Factual ranks U of H as 38th out of a total 939 colleges and universities for sheer popularity with students from United Kingdom. British students could account for as much as 0.1% of the entire student body and as much as 0.7% of the international student body at U of H.
Over the last five years the total British population of students on campus has grown at an average rate of 11.4%. The chart below shows how the total number of British students at U of H has grown over the past five years. College Factual ranks U of H as 84th best out of 490 total colleges and universities for providing a quality educational experience to British students. College Factual ranks U of H as 9th out of a total 485 colleges and universities for providing value to British students. An analysis of student visa data suggests that in 2017 as many as 9,956 Brazilian students came to the U.S. to study at American colleges and universities. From this pool of 9,956, U of H was home to approximately 20 Brazilian students. College Factual ranks U of H as 75th out of a total 873 colleges and universities for sheer popularity with students from Brazil. Brazilian students could account for as much as 0.0% of the entire student body and as much as 0.5% of the international student body at U of H.
Over the last five years the total Brazilian population of students on campus has grown at an average rate of 9.0%. The chart below shows how the total number of Brazilian students at U of H has grown over the past five years. College Factual ranks U of H as 116th best out of 442 total colleges and universities for providing a quality educational experience to Brazilian students. College Factual ranks U of H as 21st out of a total 431 colleges and universities for providing value to Brazilian students. An analysis of student visa data suggests that in 2017 as many as 2,784 Sri Lankan students came to the U.S. to study at American colleges and universities. From this pool of 2,784, U of H was home to approximately 19 Sri Lankan students. College Factual ranks U of H as 20th out of a total 420 colleges and universities for sheer popularity with students from Sri Lanka. Sri Lankan students could account for as much as 0.0% of the entire student body and as much as 0.5% of the international student body at U of H.
Over the last five years the total Sri Lankan population of students on campus has grown at an average rate of 3.0%. The chart below shows how the total number of Sri Lankan students at U of H has grown over the past five years. College Factual ranks U of H as 58th best out of 158 total colleges and universities for providing a quality educational experience to Sri Lankan students. College Factual ranks U of H as 23rd out of a total 157 colleges and universities for providing value to Sri Lankan students. An analysis of student visa data suggests that in 2017 as many as 5,965 Hong Kongese students came to the U.S. to study at American colleges and universities. From this pool of 5,965, U of H was home to approximately 18 Hong Kongese students. College Factual ranks U of H as 54th out of a total 496 colleges and universities for sheer popularity with students from Hong Kong. Hong Kongese students could account for as much as 0.0% of the entire student body and as much as 0.5% of the international student body at U of H.
Over the last five years the total Hong Kongese population of students on campus has grown at an average rate of 11.4%. The chart below shows how the total number of Hong Kongese students at U of H has grown over the past five years. College Factual ranks U of H as 89th best out of 189 total colleges and universities for providing a quality educational experience to Hong Kongese students. College Factual ranks U of H as 8th out of a total 184 colleges and universities for providing value to Hong Kongese students. An analysis of student visa data suggests that in 2017 as many as 1,770 Peruvian students came to the U.S. to study at American colleges and universities. From this pool of 1,770, U of H was home to approximately 18 Peruvian students. College Factual ranks U of H as 16th out of a total 421 colleges and universities for sheer popularity with students from Peru. Peruvian students could account for as much as 0.0% of the entire student body and as much as 0.5% of the international student body at U of H.
Over the last five years the total Peruvian population of students on campus has grown at an average rate of 21.1%. The chart below shows how the total number of Peruvian students at U of H has grown over the past five years. College Factual ranks U of H as 46th best out of 119 total colleges and universities for providing a quality educational experience to Peruvian students. College Factual ranks U of H as 6th out of a total 118 colleges and universities for providing value to Peruvian students. An analysis of student visa data suggests that in 2017 as many as 7,241 Malaysian students came to the U.S. to study at American colleges and universities. From this pool of 7,241, U of H was home to approximately 18 Malaysian students. College Factual ranks U of H as 62nd out of a total 534 colleges and universities for sheer popularity with students from Malaysia. Malaysian students could account for as much as 0.0% of the entire student body and as much as 0.5% of the international student body at U of H.
Over the last five years the total Malaysian population of students on campus has grown at an average rate of 12.1%. The chart below shows how the total number of Malaysian students at U of H has grown over the past five years. College Factual ranks U of H as 85th best out of 218 total colleges and universities for providing a quality educational experience to Malaysian students. College Factual ranks U of H as 20th out of a total 214 colleges and universities for providing value to Malaysian students. An analysis of student visa data suggests that in 2017 as many as 5,361 Thai students came to the U.S. to study at American colleges and universities. From this pool of 5,361, U of H was home to approximately 17 Thai students. College Factual ranks U of H as 59th out of a total 573 colleges and universities for sheer popularity with students from Thailand. Thai students could account for as much as 0.0% of the entire student body and as much as 0.4% of the international student body at U of H.
Over the last five years the total Thai population of students on campus has grown at an average rate of 0.3%. The chart below shows how the total number of Thai students at U of H has grown over the past five years. College Factual ranks U of H as 91st best out of 238 total colleges and universities for providing a quality educational experience to Thai students. College Factual ranks U of H as 13rd out of a total 230 colleges and universities for providing value to Thai students. An analysis of student visa data suggests that in 2017 as many as 4,089 Russian students came to the U.S. to study at American colleges and universities. From this pool of 4,089, U of H was home to approximately 14 Russian students. College Factual ranks U of H as 45th out of a total 629 colleges and universities for sheer popularity with students from Russia. Russian students could account for as much as 0.0% of the entire student body and as much as 0.4% of the international student body at U of H.
Over the last five years the total Russian population of students on campus has grown at an average rate of 13.6%. The chart below shows how the total number of Russian students at U of H has grown over the past five years. College Factual ranks U of H as 96th best out of 233 total colleges and universities for providing a quality educational experience to Russian students. College Factual ranks U of H as 11st out of a total 226 colleges and universities for providing value to Russian students. An analysis of student visa data suggests that in 2017 as many as 6,436 Indonesian students came to the U.S. to study at American colleges and universities. From this pool of 6,436, U of H was home to approximately 13 Indonesian students. College Factual ranks U of H as 67th out of a total 497 colleges and universities for sheer popularity with students from Indonesia. Indonesian students could account for as much as 0.0% of the entire student body and as much as 0.3% of the international student body at U of H.
Over the last five years the total Indonesian population of students on campus has grown at an average rate of 11.4%. The chart below shows how the total number of Indonesian students at U of H has grown over the past five years. College Factual ranks U of H as 105th best out of 203 total colleges and universities for providing a quality educational experience to Indonesian students. College Factual ranks U of H as 8th out of a total 199 colleges and universities for providing value to Indonesian students. An analysis of student visa data suggests that in 2017 as many as 2,485 Egyptian students came to the U.S. to study at American colleges and universities. From this pool of 2,485, U of H was home to approximately 12 Egyptian students. College Factual ranks U of H as 32nd out of a total 459 colleges and universities for sheer popularity with students from Egypt. Egyptian students could account for as much as 0.0% of the entire student body and as much as 0.3% of the international student body at U of H.
Over the last five years the total Egyptian population of students on campus has grown at an average rate of 29.0%. The chart below shows how the total number of Egyptian students at U of H has grown over the past five years. College Factual ranks U of H as 69th best out of 163 total colleges and universities for providing a quality educational experience to Egyptian students. College Factual ranks U of H as 10th out of a total 160 colleges and universities for providing value to Egyptian students. An analysis of student visa data suggests that in 2017 as many as 7,580 German students came to the U.S. to study at American colleges and universities. From this pool of 7,580, U of H was home to approximately 12 German students. College Factual ranks U of H as 91st out of a total 828 colleges and universities for sheer popularity with students from Germany. German students could account for as much as 0.0% of the entire student body and as much as 0.3% of the international student body at U of H.
Over the last five years the total German population of students on campus has grown at an average rate of 6.9%. The chart below shows how the total number of German students at U of H has grown over the past five years. College Factual ranks U of H as 116th best out of 343 total colleges and universities for providing a quality educational experience to German students. College Factual ranks U of H as 20th out of a total 336 colleges and universities for providing value to German students. An analysis of student visa data suggests that in 2017 as many as 1,480 Filipino students came to the U.S. to study at American colleges and universities. From this pool of 1,480, U of H was home to approximately 11 Filipino students. College Factual ranks U of H as 18th out of a total 460 colleges and universities for sheer popularity with students from Philippines. Filipino students could account for as much as 0.0% of the entire student body and as much as 0.3% of the international student body at U of H.
Over the past five years the total Filipino population of students on campus has shrunk. The chart below shows how the total number of Filipino students at U of H has grown over the past five years. College Factual ranks U of H as 67th best out of 122 total colleges and universities for providing a quality educational experience to Filipino students. College Factual ranks U of H as 10th out of a total 120 colleges and universities for providing value to Filipino students. An analysis of student visa data suggests that in 2017 as many as 1,760 Ecuadorian students came to the U.S. to study at American colleges and universities. From this pool of 1,760, U of H was home to approximately 10 Ecuadorian students. College Factual ranks U of H as 37th out of a total 479 colleges and universities for sheer popularity with students from Ecuador. Ecuadorian students could account for as much as 0.0% of the entire student body and as much as 0.3% of the international student body at U of H.
Over the last five years the total Ecuadorian population of students on campus has grown at an average rate of 16.4%. The chart below shows how the total number of Ecuadorian students at U of H has grown over the past five years. College Factual ranks U of H as 73rd best out of 120 total colleges and universities for providing a quality educational experience to Ecuadorian students. College Factual ranks U of H as 8th out of a total 119 colleges and universities for providing value to Ecuadorian students. An analysis of student visa data suggests that in 2017 as many as 6,861 French students came to the U.S. to study at American colleges and universities. From this pool of 6,861, U of H was home to approximately 10 French students. College Factual ranks U of H as 97th out of a total 726 colleges and universities for sheer popularity with students from France. French students could account for as much as 0.0% of the entire student body and as much as 0.3% of the international student body at U of H.
Over the last five years the total French population of students on campus has grown at an average rate of 15.1%. The chart below shows how the total number of French students at U of H has grown over the past five years. College Factual ranks U of H as 105th best out of 290 total colleges and universities for providing a quality educational experience to French students. College Factual ranks U of H as 12nd out of a total 285 colleges and universities for providing value to French students. An analysis of student visa data suggests that in 2017 as many as 1,509 Jordanian students came to the U.S. to study at American colleges and universities. From this pool of 1,509, U of H was home to approximately 10 Jordanian students. College Factual ranks U of H as 29th out of a total 431 colleges and universities for sheer popularity with students from Jordan. Jordanian students could account for as much as 0.0% of the entire student body and as much as 0.3% of the international student body at U of H.
Over the last five years the total Jordanian population of students on campus has grown at an average rate of 2.4%. The chart below shows how the total number of Jordanian students at U of H has grown over the past five years. College Factual ranks U of H as 53rd best out of 136 total colleges and universities for providing a quality educational experience to Jordanian students. College Factual ranks U of H as 11st out of a total 133 colleges and universities for providing value to Jordanian students. An analysis of student visa data suggests that in 2017 as many as 5,007 Spanish students came to the U.S. to study at American colleges and universities. From this pool of 5,007, U of H was home to approximately 10 Spanish students. College Factual ranks U of H as 84th out of a total 734 colleges and universities for sheer popularity with students from Spain. Spanish students could account for as much as 0.0% of the entire student body and as much as 0.3% of the international student body at U of H.
Over the last five years the total Spanish population of students on campus has grown at an average rate of 16.3%. The chart below shows how the total number of Spanish students at U of H has grown over the past five years. College Factual ranks U of H as 102nd best out of 281 total colleges and universities for providing a quality educational experience to Spanish students. College Factual ranks U of H as 12nd out of a total 277 colleges and universities for providing value to Spanish students. An analysis of student visa data suggests that in 2017 as many as 16,890 Japanese students came to the U.S. to study at American colleges and universities. From this pool of 16,890, U of H was home to approximately 8 Japanese students. College Factual ranks U of H as 241st out of a total 802 colleges and universities for sheer popularity with students from Japan. Japanese students could account for as much as 0.0% of the entire student body and as much as 0.2% of the international student body at U of H.
Over the last five years the total Japanese population of students on campus has grown at an average rate of 8.4%. The chart below shows how the total number of Japanese students at U of H has grown over the past five years. College Factual ranks U of H as 163rd best out of 437 total colleges and universities for providing a quality educational experience to Japanese students. College Factual ranks U of H as 47th out of a total 426 colleges and universities for providing value to Japanese students. An analysis of student visa data suggests that in 2017 as many as 11,723 Kuwaiti students came to the U.S. to study at American colleges and universities. From this pool of 11,723, U of H was home to approximately 8 Kuwaiti students. College Factual ranks U of H as 111st out of a total 319 colleges and universities for sheer popularity with students from Kuwait. Kuwaiti students could account for as much as 0.0% of the entire student body and as much as 0.2% of the international student body at U of H.
Over the last five years the total Kuwaiti population of students on campus has grown at an average rate of 20.5%. The chart below shows how the total number of Kuwaiti students at U of H has grown over the past five years. College Factual ranks U of H as 103rd best out of 179 total colleges and universities for providing a quality educational experience to Kuwaiti students. College Factual ranks U of H as 28th out of a total 175 colleges and universities for providing value to Kuwaiti students. An analysis of student visa data suggests that in 2017 as many as 1,496 Norwegian students came to the U.S. to study at American colleges and universities. From this pool of 1,496, U of H was home to approximately 8 Norwegian students. College Factual ranks U of H as 31st out of a total 407 colleges and universities for sheer popularity with students from Norway. Norwegian students could account for as much as 0.0% of the entire student body and as much as 0.2% of the international student body at U of H.
Over the last five years the total Norwegian population of students on campus has grown at an average rate of 105.0%. The chart below shows how the total number of Norwegian students at U of H has grown over the past five years. College Factual ranks U of H as 35th best out of 89 total colleges and universities for providing a quality educational experience to Norwegian students. College Factual ranks U of H as 3rd out of a total 89 colleges and universities for providing value to Norwegian students. An analysis of student visa data suggests that in 2017 as many as 1,688 Greek students came to the U.S. to study at American colleges and universities. From this pool of 1,688, U of H was home to approximately 7 Greek students. College Factual ranks U of H as 41st out of a total 348 colleges and universities for sheer popularity with students from Greece. Greek students could account for as much as 0.0% of the entire student body and as much as 0.2% of the international student body at U of H.
Over the last five years the total Greek population of students on campus has grown at an average rate of 34.2%. The chart below shows how the total number of Greek students at U of H has grown over the past five years. College Factual ranks U of H as 72nd best out of 104 total colleges and universities for providing a quality educational experience to Greek students. College Factual ranks U of H as 2nd out of a total 103 colleges and universities for providing value to Greek students. An analysis of student visa data suggests that in 2017 as many as 4,210 Italian students came to the U.S. to study at American colleges and universities. From this pool of 4,210, U of H was home to approximately 6 Italian students. College Factual ranks U of H as 100th out of a total 548 colleges and universities for sheer popularity with students from Italy. Italian students could account for as much as 0.0% of the entire student body and as much as 0.2% of the international student body at U of H.
Over the last five years the total Italian population of students on campus has grown at an average rate of 26.1%. The chart below shows how the total number of Italian students at U of H has grown over the past five years. College Factual ranks U of H as 122nd best out of 190 total colleges and universities for providing a quality educational experience to Italian students. College Factual ranks U of H as 17th out of a total 186 colleges and universities for providing value to Italian students. An analysis of student visa data suggests that in 2017 as many as 3,177 Australian students came to the U.S. to study at American colleges and universities. From this pool of 3,177, U of H was home to approximately 6 Australian students. College Factual ranks U of H as 65th out of a total 670 colleges and universities for sheer popularity with students from Australia. Australian students could account for as much as 0.0% of the entire student body and as much as 0.2% of the international student body at U of H.
Over the last five years the total Australian population of students on campus has grown at an average rate of 32.1%. The chart below shows how the total number of Australian students at U of H has grown over the past five years. College Factual ranks U of H as 88th best out of 167 total colleges and universities for providing a quality educational experience to Australian students. College Factual ranks U of H as 7th out of a total 166 colleges and universities for providing value to Australian students. An analysis of student visa data suggests that in 2017 as many as 2,155 Ghanaian students came to the U.S. to study at American colleges and universities. From this pool of 2,155, U of H was home to approximately 6 Ghanaian students. College Factual ranks U of H as 75th out of a total 577 colleges and universities for sheer popularity with students from Ghana. Ghanaian students could account for as much as 0.0% of the entire student body and as much as 0.2% of the international student body at U of H.
Over the last five years the total Ghanaian population of students on campus has grown at an average rate of 13.7%. The chart below shows how the total number of Ghanaian students at U of H has grown over the past five years. College Factual ranks U of H as 87th best out of 194 total colleges and universities for providing a quality educational experience to Ghanaian students. College Factual ranks U of H as 23rd out of a total 193 colleges and universities for providing value to Ghanaian students. An analysis of student visa data suggests that in 2017 as many as 1,804 Kenyan students came to the U.S. to study at American colleges and universities. From this pool of 1,804, U of H was home to approximately 4 Kenyan students. College Factual ranks U of H as 94th out of a total 628 colleges and universities for sheer popularity with students from Kenya. Kenyan students could account for as much as 0.0% of the entire student body and as much as 0.1% of the international student body at U of H.
Over the last five years the total Kenyan population of students on campus has grown at an average rate of 21.7%. The chart below shows how the total number of Kenyan students at U of H has grown over the past five years. College Factual ranks U of H as 76th best out of 168 total colleges and universities for providing a quality educational experience to Kenyan students. College Factual ranks U of H as 21st out of a total 166 colleges and universities for providing value to Kenyan students. An analysis of student visa data suggests that in 2017 as many as 1,559 students came to the U.S. to study at American colleges and universities. From this pool of 1,559, U of H was home to approximately 4 students. College Factual ranks U of H as 60th out of a total 424 colleges and universities for sheer popularity with students from Bahamas. students could account for as much as 0.0% of the entire student body and as much as 0.1% of the international student body at U of H.
Over the last five years the total population of students on campus has grown at an average rate of 46.7%. The chart below shows how the total number of students at U of H has grown over the past five years. College Factual ranks U of H as 20th best out of 88 total colleges and universities for providing a quality educational experience to students. College Factual ranks U of H as 14th out of a total 86 colleges and universities for providing value to students. An analysis of student visa data suggests that in 2017 as many as 2,759 Emirati students came to the U.S. to study at American colleges and universities. From this pool of 2,759, U of H was home to approximately 4 Emirati students. College Factual ranks U of H as 92nd out of a total 230 colleges and universities for sheer popularity with students from United Arab Emirates. Emirati students could account for as much as 0.0% of the entire student body and as much as 0.1% of the international student body at U of H.
Over the last five years the total Emirati population of students on campus has grown at an average rate of 61.9%. The chart below shows how the total number of Emirati students at U of H has grown over the past five years. College Factual ranks U of H as 69th best out of 104 total colleges and universities for providing a quality educational experience to Emirati students. College Factual ranks U of H as 16th out of a total 101 colleges and universities for providing value to Emirati students. An analysis of student visa data suggests that in 2017 as many as 4,433 Singaporean students came to the U.S. to study at American colleges and universities. From this pool of 4,433, U of H was home to approximately 4 Singaporean students. College Factual ranks U of H as 104th out of a total 382 colleges and universities for sheer popularity with students from Singapore. Singaporean students could account for as much as 0.0% of the entire student body and as much as 0.1% of the international student body at U of H.
Over the last five years the total Singaporean population of students on campus has grown at an average rate of 54.0%. The chart below shows how the total number of Singaporean students at U of H has grown over the past five years. College Factual ranks U of H as 103rd best out of 130 total colleges and universities for providing a quality educational experience to Singaporean students. College Factual ranks U of H as 4th out of a total 128 colleges and universities for providing value to Singaporean students. An analysis of student visa data suggests that in 2017 as many as 1,515 Israeli students came to the U.S. to study at American colleges and universities. From this pool of 1,515, U of H was home to approximately 3 Israeli students. College Factual ranks U of H as 81st out of a total 332 colleges and universities for sheer popularity with students from Israel. Israeli students could account for as much as 0.0% of the entire student body and as much as 0.1% of the international student body at U of H.
Over the last five years the total Israeli population of students on campus has grown at an average rate of 45.8%. The chart below shows how the total number of Israeli students at U of H has grown over the past five years. An analysis of student visa data suggests that in 2017 as many as 1,932 Jamaican students came to the U.S. to study at American colleges and universities. From this pool of 1,932, U of H was home to approximately 3 Jamaican students. College Factual ranks U of H as 130th out of a total 514 colleges and universities for sheer popularity with students from Jamaica. Jamaican students could account for as much as 0.0% of the entire student body and as much as 0.1% of the international student body at U of H.
Over the last five years the total Jamaican population of students on campus has grown at an average rate of 40.0%. The chart below shows how the total number of Jamaican students at U of H has grown over the past five years. An analysis of student visa data suggests that in 2017 as many as 874 Ukrainian students came to the U.S. to study at American colleges and universities. From this pool of 874, U of H was home to approximately 2 Ukrainian students. College Factual ranks U of H as 113rd out of a total 416 colleges and universities for sheer popularity with students from Ukraine. Ukrainian students could account for as much as 0.0% of the entire student body and as much as 0.1% of the international student body at U of H.
Over the past five years the total Ukrainian population of students on campus has shrunk. The chart below shows how the total number of Ukrainian students at U of H has grown over the past five years. An analysis of student visa data suggests that in 2017 as many as 1,117 Dutch students came to the U.S. to study at American colleges and universities. From this pool of 1,117, U of H was home to approximately 1 Dutch students. College Factual ranks U of H as 172nd out of a total 489 colleges and universities for sheer popularity with students from Netherlands. Dutch students could account for as much as 0.0% of the entire student body and as much as 0.0% of the international student body at U of H.
Over the last five years the total Dutch population of students on campus has grown at an average rate of N/A. The chart below shows how the total number of Dutch students at U of H has grown over the past five years. An analysis of student visa data suggests that in 2017 as many as 3,041 Omani students came to the U.S. to study at American colleges and universities. From this pool of 3,041, U of H was home to approximately 1 Omani students. College Factual ranks U of H as 87th out of a total 157 colleges and universities for sheer popularity with students from Oman. Omani students could account for as much as 0.0% of the entire student body and as much as 0.0% of the international student body at U of H.
Over the last five years the total Omani population of students on campus has grown at an average rate of 50.0%. The chart below shows how the total number of Omani students at U of H has grown over the past five years. An analysis of student visa data suggests that in 2017 as many as 1,991 Swedish students came to the U.S. to study at American colleges and universities. From this pool of 1,991, U of H was home to approximately 1 Swedish students. College Factual ranks U of H as 376th out of a total 588 colleges and universities for sheer popularity with students from Sweden. Swedish students could account for as much as 0.0% of the entire student body and as much as 0.0% of the international student body at U of H.
Over the last five years the total Swedish population of students on campus has remained approximately the same. The chart below shows how the total number of Swedish students at U of H has grown over the past five years. An analysis of student visa data suggests that in 2017 as many as 868 Mongolian students came to the U.S. to study at American colleges and universities. From this pool of 868, U of H was home to approximately 1 Mongolian students. College Factual ranks U of H as 171st out of a total 292 colleges and universities for sheer popularity with students from Mongolia. Mongolian students could account for as much as 0.0% of the entire student body and as much as 0.0% of the international student body at U of H.
Over the last five years the total Mongolian population of students on campus has grown at an average rate of 0.0%. The chart below shows how the total number of Mongolian students at U of H has grown over the past five years. The fact that University of Houston has a medium sized community of international students is positive. It is likely the school has invested in International Student Services as well as clubs, groups, and associations. Learn more about out-of-state tuition at University of Houston. How many international students are at U of H? There are approximately 3,995 international students at U of H​; they make up 9.1% of all total students. How much does it cost for an international student to attend U of H? Out-of-state tuition at U of H​ is USD 22,066 per year. This does not include room and board or additional student fees that may add to your costs. Go to the U of H tuition & fees page for more information, and contact the school for details. Is there financial help available for international students? Contact the school to see what kind of scholarships, grants, financial aid or loans may be available to you as an international student. Some schools set aside on-campus jobs for international students to help them defray costs. Check in early to apply to these jobs as they may go quickly. Are there international student associations on campus? Contact the school to see what kind of student services, associations, clubs, and groups are open to you as an international student.